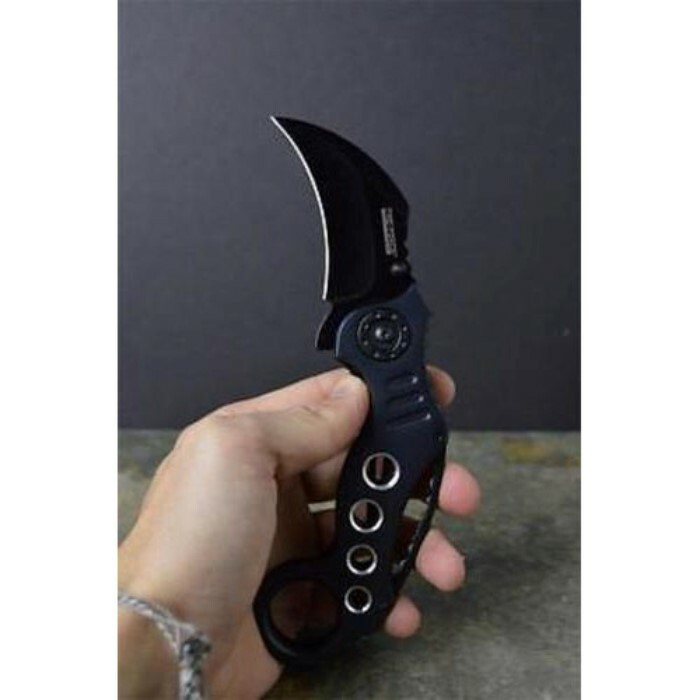 Gun Metal Tac-Force Spring Assist Modern Karambit Folding Knife | BUDK.com - Knives & Swords At The Lowest Prices! 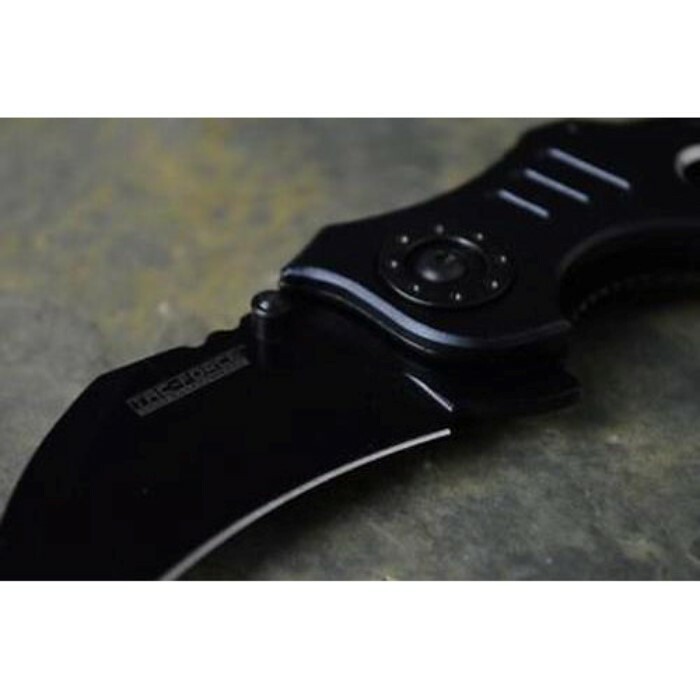 This Tac-Force Modern Folding Karambit features a stainless steel blade and a rugged reinforced gun metal aluminum handle complete with a pocket clip. The all-black blade swings open effortlessly with the help of the spring-assisted mechanism. 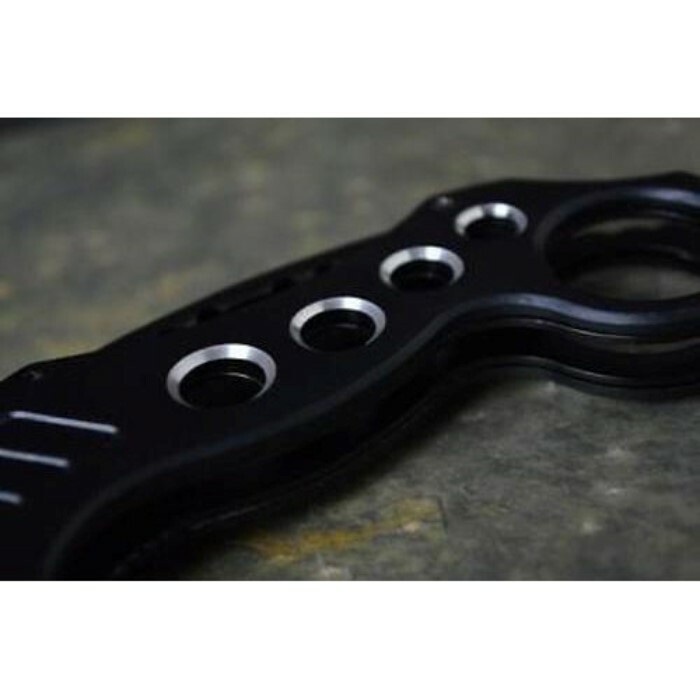 The large finger hole gives it a covert, tactical look and feel. It makes a great everyday carry pocket knife at 5 3/8" closed. I've had this knife for a few days now, and while I haven't put it through any rigorous testing, I can say right off the bat that it's not a well-made knife, but then for $8.00 you shouldn't be expecting high-quality. 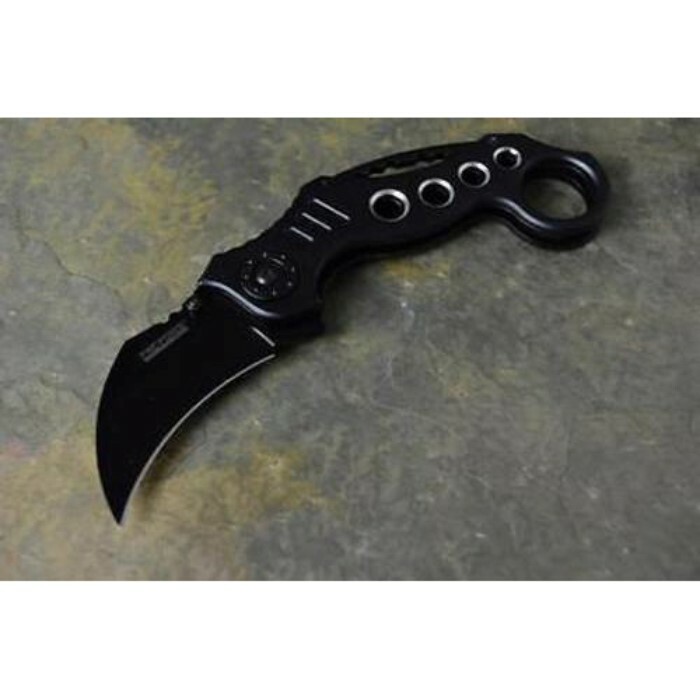 all in all, if you're looking for a cheap karambit to see if you like the basic design (which I was), this'll probably be a good choice. but if you already know you want a karambit, invest in something of a higher quality, because this thing is only about as good as you could expect for the price. Very smooth blade action and locks solidly when fully opened. Very minor scratches on the surface of the knife handle on the edges but nothing too noticeable. Overall happy with the condition. 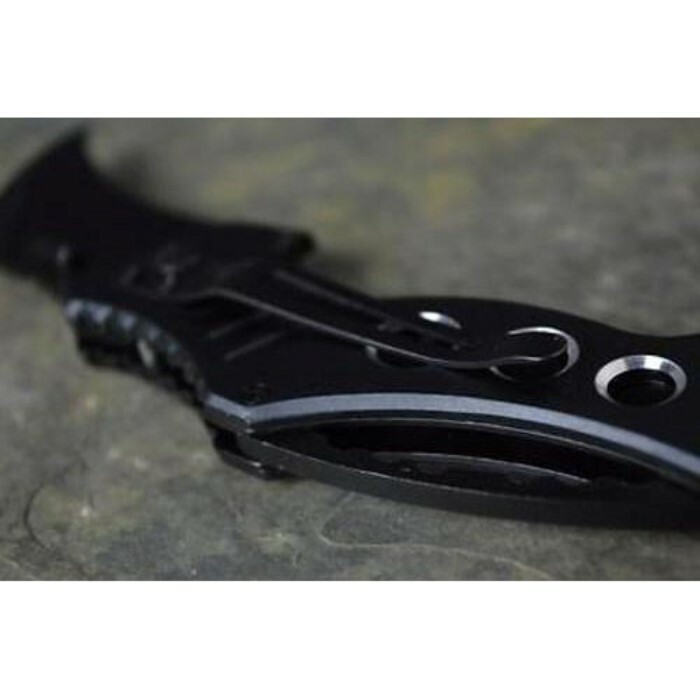 Really awesome knife but WILL fall out of your pocket, even if clipped to your pants. Fell out of my pocket twice one day, the second time I didn't notice and lost it. 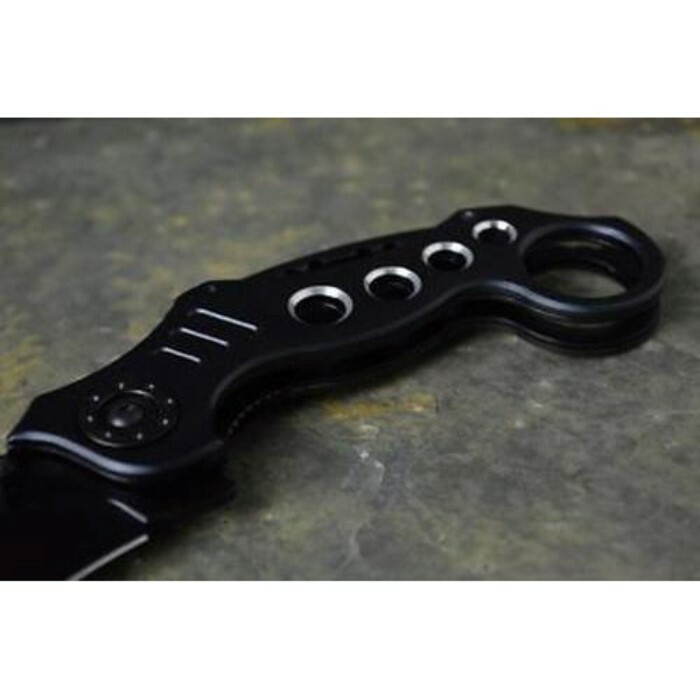 Great Karambit. 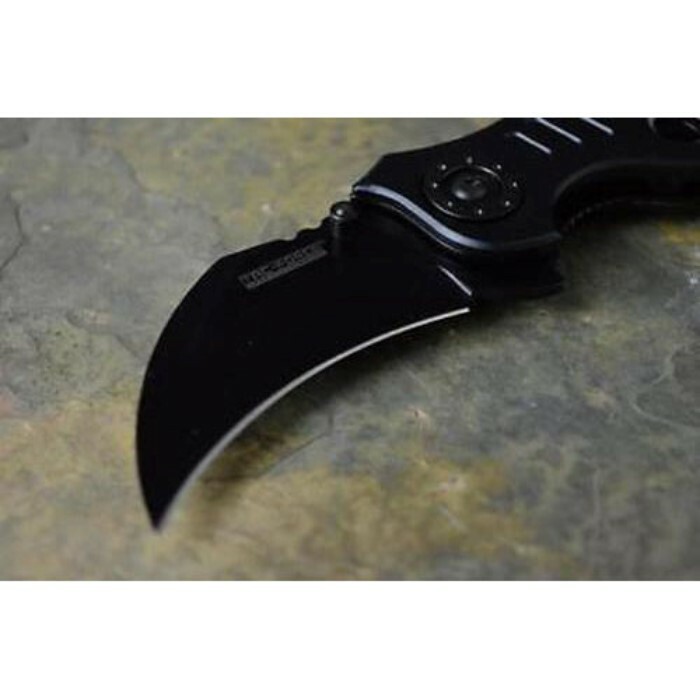 The blade isn't sharp but since a Karambit is meant for the tip to penetrate I guess it really doesn't matter. Great size. It's bigger than I thought. All in all its a great thing to have for collectors like myself. I would recommend this to all who enjoy knives as much as I do. I'm no fan of spring assist. That being said, the spring in this knife is much stronger than i thought it would be, it's quality, large, sturdy, and heavy. For $8.00 it's a must have, I'd have spent 15 or better. the gray is actually darker than in the picture, very sharp right out of the box. it was a bit larger than i expected, and the shipment was really fast. 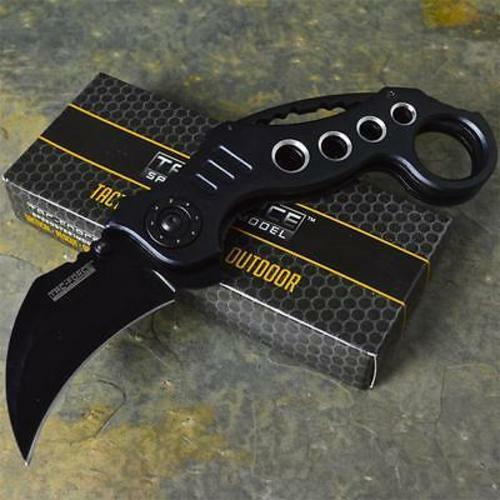 the only thing i dont like about the karambit is the clip placement. the clip is in a posiition where the finger ring part of the knife is facing downward. aside from the clip, this is a great knife. I'm an electrican and this knife is the one I carry in all situations. Its the best knife I've owned for removing the insulation on wiring. The curved tip and finger hole makes for a good combo for ripping down the wire and not worring about it slipping out of your hand! The price is right and I only lack one color having 2 of each.It holds its edge very well and when I do have to re-sharpen a couple swipes on a kitchen knife wheel and its back to buisness. Highly recomended!! !